So, we've gotten the system passwords. It gets worse and worse as it goes on. What are we to do next? Right, we'll need to decrypt the System's Master Key. 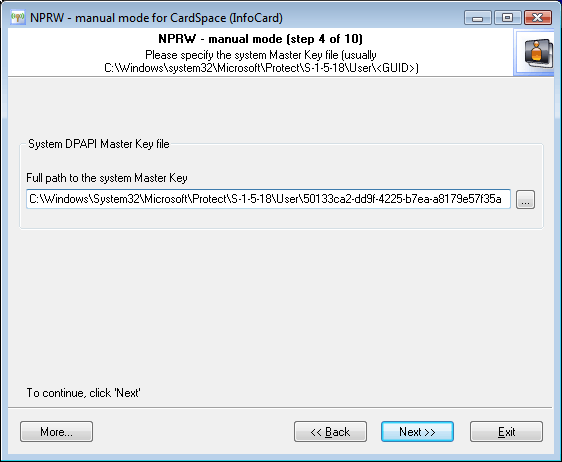 If you remember that, system's Master Key along with User's Master Key is involved in the decryption of CardSpace Master Key. Hmm: Sounds quite funny. If it keeps going that way, soon enough Windows developers will have to invent a Super-Mega-Extra-Master Key. Skipping unnecessary details and speaking the human language, on this step we will need to set the path to the file, which normally resides in the following folder: %WINDIR%\system32\Microsoft\Protect\S-1-5-18\User. The application will figure out the file name automatically, using the data obtained on the previous steps. The only thing you will have to do is to set the path to that folder.